The opening night of the "Why Wait For Heaven" retreat in Capala, Mexico. La Casa De Milagros inaugural event: 31 have gathered in central Mexico from countries as far away as South Africa, New Zealand, Holland, Denmark, England, Australia for the experience of Happiness and Joy! 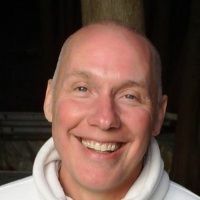 David Hoffmeister and friends are beaming and radiating their hearts across the universe and beyond.